Hemp protein, made from the hemp seed, is a high-fiber protein supplement that can be used to enhance total protein intake for vegans and non-vegans alike. Hemp can be considered a superior protein source due to its above-average digestibility, which also makes it ideal for athletes. Additional benefits of hemp protein include potential immune enhancing and anti-fatigue properties, as well as kidney-protective effects. Hemp is a remarkably diverse crop that can be grown for both food and nonfood purposes. Hemp seed, which is used to manufacture hemp protein, is composed of approximately 45 percent oil, 35 percent protein and 10 percent carbohydrates. The hemp seed possesses many nutritional benefits, according to Agriculture and Agri-food Canada. In addition to its health benefits, hemp is very environmentally friendly, as it can be grown without the use of fungicides, herbicides and pesticides and it efficiently absorbs carbon dioxide. Hemp protein is a high quality source of protein due to its high rate of digestibility. The better a protein is digested, the more efficiently it can be used by the body. The digestibility of any given protein is related to the concentrations of its amino acids. A study published in 2010 in the "Journal of Agricultural and Food Chemistry" tested the protein digestibility-corrected amino acid score (PDAAS) -- a rating that determines the bioavailability of a protein -- for various proteins derived from the hemp seed. The results showed that hemp seed proteins have PDAAS values greater than or equal to some grains, nuts and legumes. Hemp protein powders are rich in fiber, a nutrient that has a number of valuable health promoting properties. Diets rich in fiber can lower your risk for heart disease, type-2 diabetes, constipation and diverticular disease, notes the Harvard Public School of Health. A single serving of hemp protein powder can provide a significant portion of the 20 to 35 grams of fiber per day recommended for adults, children and older adolescents. For example, one brand of hemp powder contains 12 grams of fiber per 30 grams scoop, an amount substantially higher than most other types of protein. According to an animal study published in 2008 in "Wei Sheng Yan Jui," hemp seed protein may have anti-fatigue and immune enhancing benefits. Compared to a controlled group, mice given hemp seed protein had improved swimming times and decreased blood lactic acid. Another study published in 2011 in "Molecular Nutrition & Food Research" found that, in animal models, soy and hemp protein supplemented diets were able to improve kidney function and cardiac hypertrophy associated with kidney disease. 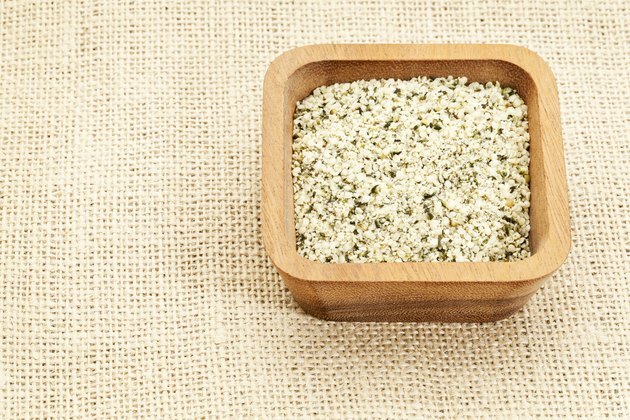 How Much Hemp Protein Should You Take in a Day? Do Hemp Seeds Contain Healthy Omega-3 Fatty Acids? Is Hemp Protein Good for Bodybuilding?